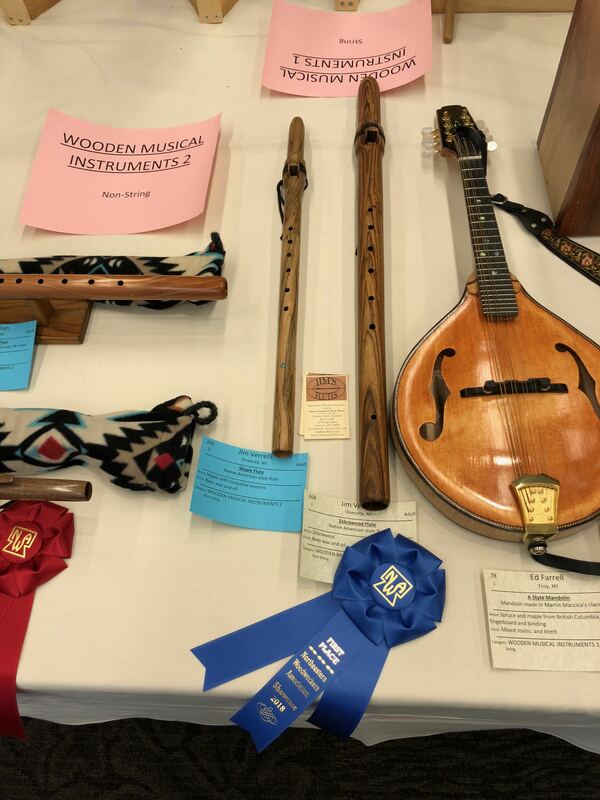 I did not exhibit this year, but I did enter a 1" Zebrawood flute and was awarded a first place Ribbon. 5th year vending at this festival. 7th year vending at this festival. This continues to be one of my favorite shows. Town Hall & Park, So. Main St. I believe this is my 4th time vending at this festival. 6th time vending at this festival. This continues to be one of my favorite shows. This will be my 10th year vending at this festival. I will be exhibiting my flutes for purchase. I believe this is my 3rd time vending at this festival. 1st time vending at this festival. It looks to be a great event (54th Annual!). 5th time vending at this festival. This continues to be one of my favorite shows. This will be my 9th year vending at this festival. 4th time vending at this festival. This continues to be one of my favorite shows. This will be my 8th year vending at this festival. This will be my 1st time vending at this show, but it is the 39th year the show is beng held. This year's theme is Winds of Remembrance. Personally, I will be remembering Leonard and Marvin who have journeyed beyond this world this past year. I will be vending. 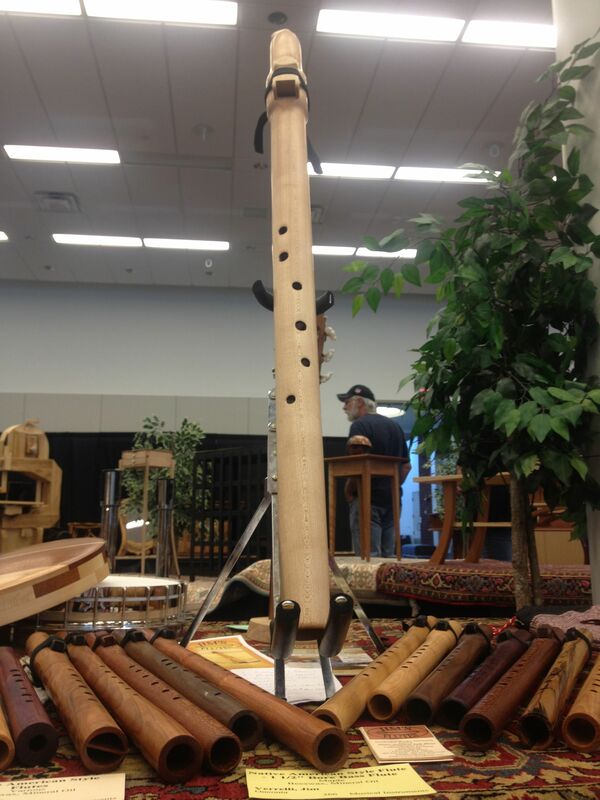 This year I will be participating in the feature exhibit of Handmade Wooden Musical Instruments. I may be presenting a lecture on my flute making process with tips and things I have learned. I will have finished flutes and flutes in various stages of construction on display and for purchase (only the finished ones of course). 3rd time vending at this festival. This continues to be one of my favorite shows. This will be my 7th year vending at this festival. The festival returns after a year sabbatical. I will be vending. 1st time vending at this festival. Looks to be a fun filled weekend. Festival entrance location: 2195 State Route 79, Harpursville NY 13787. 2nd time vending at this festival. It was a very good show last year and I'm looking forward to it again this year. This will be my 6th year vending at this festival. This will be my 4th year vending at this festival. 2nd year attending the showcase. 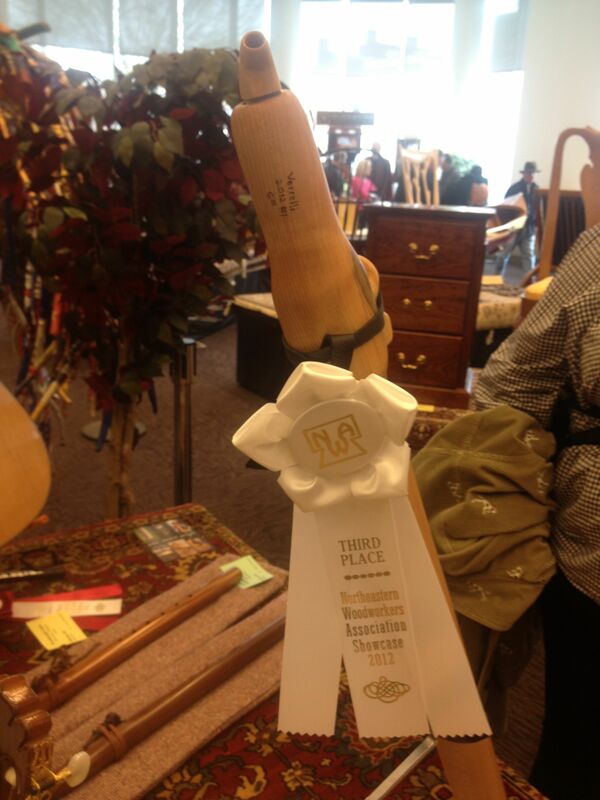 This year I entered a 1 1/2" Bore Maple Flute in the Musical Instruments cagegory and received a 3rd place ribbon. First and second places when to some very beautiful guitars. The Community Arts Network of Oneonta (CANO - formerly UCCCA) and The Oneonta Concert Association (OCA) sponsored this event. It was a beautiful display of music related art. I played my flutes and shared stage time with a couple of great classical guitarists. I left behind a couple of flutes to display during the exehibition. 1st time vending at this festival. It looks to be a great show. This will be my 5th year vending at this festival. I have been working in the Chicago area for nearly a year now and I have found two Flute Circles that I try to attend while I'm there. 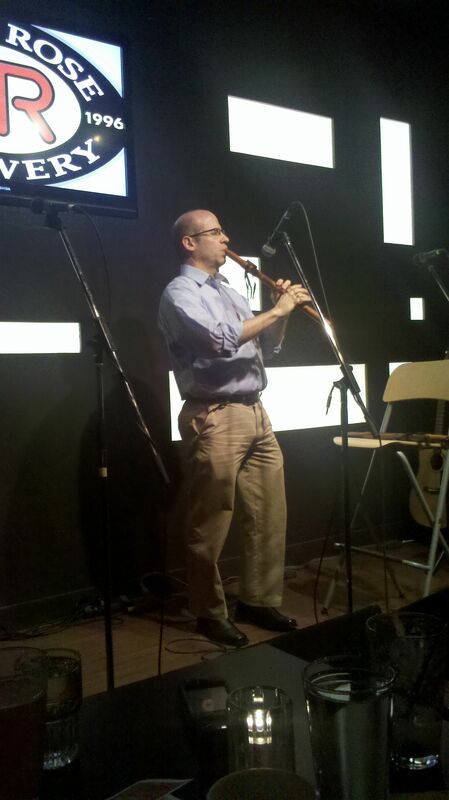 The Thursday Flute Circle, organized by Rob Miller, usually meets at the museum and has been asked to provide music during the party. I am fortunate enough to be in town and will be joining in the performance. I will be performing at various times during market hours. This will be my 3rd year vending at this festival. I have participated as a Guest Teacher on the field trip several times in recent years. This year I will unfortunately be out of town for the first day of the trip, but I am hoping to be able to participate on the last day. This is the first time I will be vending at this festival. Although it is a two day festival, I will only be vending the first day and moving on to the Miller's Harvest festival on the second day. This is the first time I will be vending at this festival. 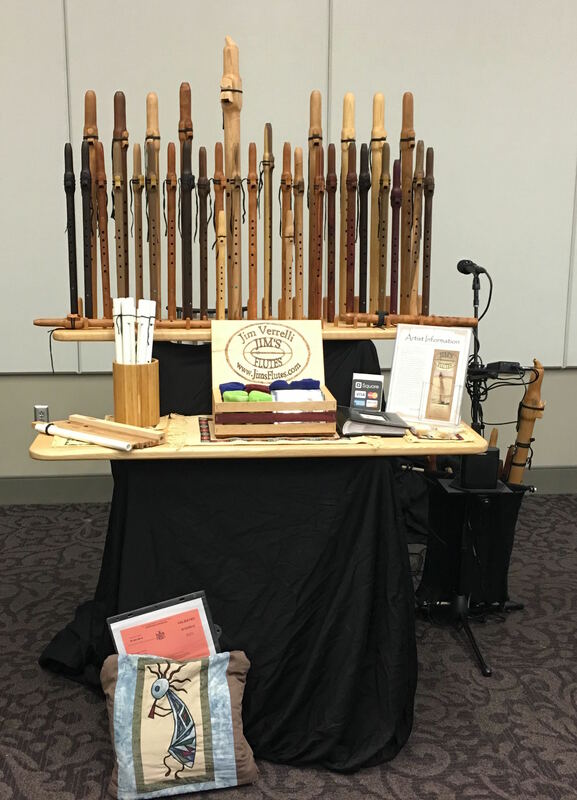 I will also be demonstrating various steps in my flute making process and playing some flutes. Wightman's has a Columbus Day Open House every year. Part of that event is a woodworking related Contest or Auction. I have been participating since 2007 and plan on participating again this year. UPDATE: No woodworking event is planned this year. I will be performing at the Gallery during the Frist Friday Art Walk. In addition to my improvisational music, I will be mixing in some Seasonal melodies. I will also have flutes and CDs available for sale. I worked in Calgary through the beginning of October and found Cafe Koi which holds a Singer Songwriter Open Mic on Tuesday nights. I spent many Tuedsay nights playing my flutes and singing some of my songs. 1st year attending the showcase. 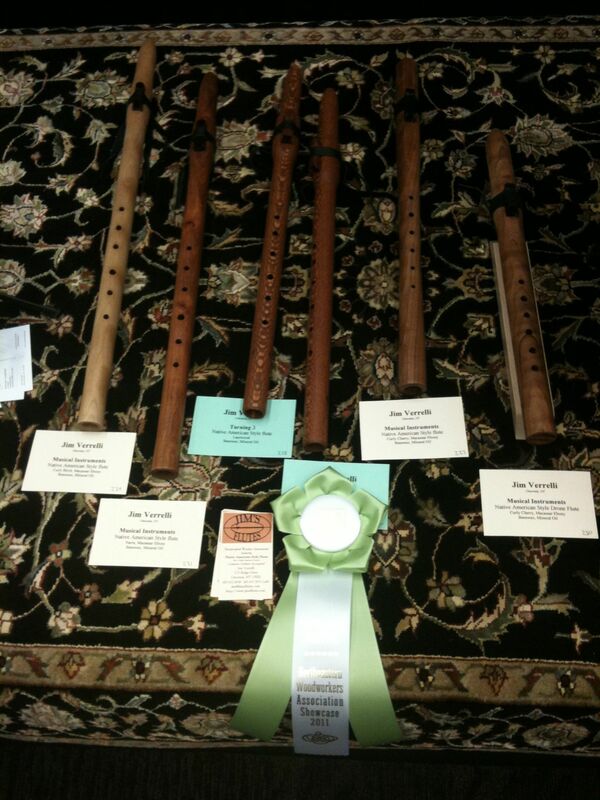 I entered Lacewood Flutes in a Truning Category and the Musical Instruments Categry. I received an Honorable Mention ribbon for the Musical Instruments Category. There were not enough Musical Instrument entries to judge fully. 2nd year vending at this festival. This will be my 2nd year vending at this festival. I participated in the field trip again as a Guest Teacher. I showed students how I make flutes and taught them how to play. I had close to 2 dozen students attend my sessions and each received one of my beginner flutes. Last year I attended this festival for the first time and enjoyed it. This year I wanted to be a vendor, but I applied too late. I was dissapointed, but was still looking forward to attending the festival again. At last minute I received word that a vendor had dropped out, leaving a spot open for me. So, I will be vending at the festival. I will be playing my flutes several times during the day and demonstrating flutes in various stages of construction. I am not planning to vending at this festival, but they would like me to stop by and play my flutes if I am available. This will be my 1st year vending at this festival. I participated in the field trip as a Guest Teacher two years ago. Last year the field trip was canceled. Hopefully this year it will make it back into the school calendar. Last years event was a silent auction. Previous to that it was a wood working contest. I'm not sure what they will be having this year, but I plan to participate. This will be my 2nd year vending at this festival. Last year I received First Place in the Artisan Crafts Category. Last year I participated in the field trip as a Guest Teacher. I showed the students how I make my flutes and taught them playing basics. Each student was given a PVC Beginner Flute to decorate, play and keep. I am hoping to participate again this year. Date TBD (hopefully before it gets too cold out!) UPDATE: The field trip was canceled. I'll be entering the Woodworking contest again this year. Last year I was awarded First Place in the Miscellenous Category.